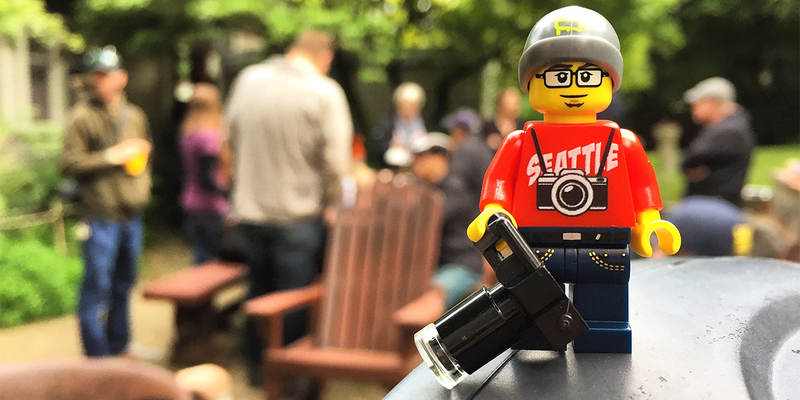 One of the more memorable opportunities to come out of this whole experience of “In LEGO, We Connect” has been meeting and interacting with Chris Pirillo, a local and influential tech blogger here in Seattle. It seems Chris loves the LEGO mini figure as much as we do and was more than happy to meet us at the gallery for a personal tour. It seems Chris has been following Boris, Vesa and I for some time on Instagram and is one of our biggest fans. When Kitty and I decided to reach out to Chris when we were setting up our PR plan, we had no idea we would be connecting with such a big fan and one so willing to help us spread the word about our work. Not only did Chris come to the gallery and interview all three of us, he put together this really incredible video; it is a wonderful snap shot of a moment in time. It is also a great glimpse of the work in the gallery and approximately four minutes from each of us trying to talk coherently about our work. I hope you will give it a watch and learn a little bit more about the folks behind StuckinPlastic. Thank you Chris for taking the time to make this awesome video and share it with your community. It is a real gift and we are forever in your debt. You can follow Chris on Twitter, Facebook, Google and Instagram. I’m sure it is no real surprise that neither Me2 nor Avanaut have visited Seattle or the Pacific Northwest. Seattle has always had a reputation as being beautiful, but a little out of the way. So I thought I should let them know a little bit about my city and start planning what we can do in our free time before they get here. Pike Place Market, home of the flying fish and the gum wall. Olympic Sculpture Park – a little reconnoissance before the photo walk would be nice. Chihuly Glass Museum – if for no other reason than to see the Edward S Curtis photographs I wrote about earlier. Experience Music Project – because they have the Star Wars and the Power of Costume exhibit up. It seems Vesa has already seen most of these up close and personal, but the chance for me to see this exhibit through his eyes is a chance I can’t pass up. Seattle Central Library designed by Rem Koolhaas who has his own Lego connection. Snoqualmie Falls – because sit is just so darn pretty and a great photo location. Deception Pass – another iconic destination just outside Seattle. This is my short list of places to visit and explore in and around Seattle. We will also see Pioneer Square (the original heart of Seattle), Bertha (the tunnel boring machine stuck under Seattle for over a year) and take a walk along Seattle’s waterfront. Is their anyplace you think I should take Boris and Vesa? If you have been to Seattle, what is your favorite thing to do here? Leave a few suggestions below and help me make this a visually memorable trip. Because all work and no play will make us all very dull indeed. Seattle Dream Pt. II from F-Stop Seattle on Vimeo.